Special friends and family members or perhaps a colleague you’d like to thank. If they deserve a special surprise, give them their “just desserts” in the form of our bright, light, and refreshing springtime bouquet. 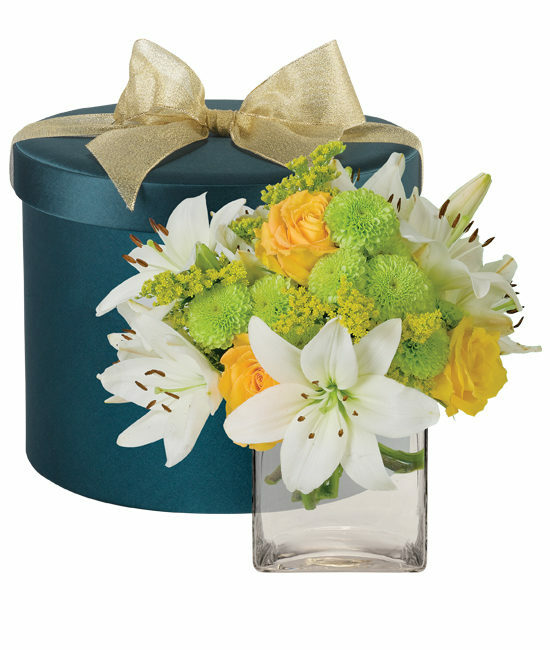 White Asiatic lilies, sunshine yellow Skyline roses, green button mums, and yellow solidago arrange themselves with ease in our clear glass vase. For the ultimate presentation, have your bouquet delivered in our elegant keepsake hatbox. Gently lift the bouquet from the slotted center. Fill your vessel ¾ full with warm water and add the contents of the Calyx floral preservative package. Remove the hydration system from the stems, the foam is a bio-degradable material and can be discarded safely. Keep band around end of bouquet. Trim about a ½” from the bottom of your bouquet while holding the stems under water, and place immediately in the vessel. Keep your arrangement away from drafts, direct sunlight and excessive heat or cold. Change water and recut the stems every 2-3 days to maximize longevity.